A Quarterly Record of the Society's Transactions, with Occasional Notes on Freemasonry and other kindred subjects. 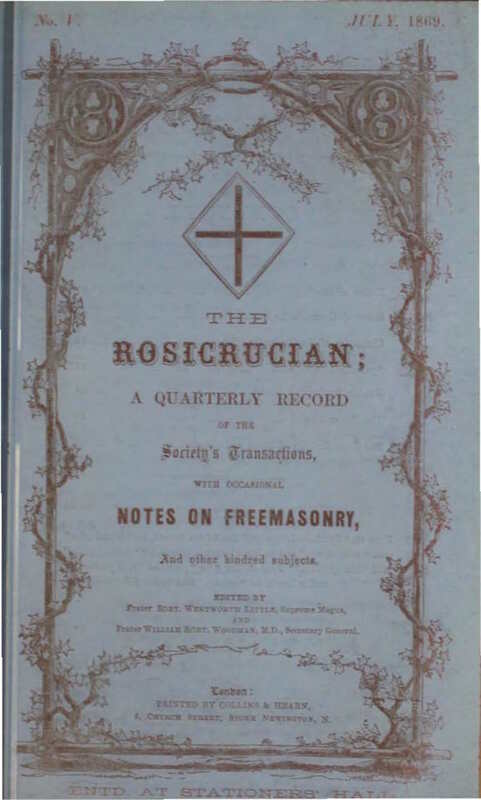 Other titles: The Rosicrucian and Red Cross 1868-1874 Quarterly London, England. Corporate author: Societas Rosicruciana in Anglia 1/1, July 1868-November 1874. From February 1873 to November 1874 the journal, otherwise unchanged, was called The Rosicrucian and Red Cross. 12-18 pp. Organ of the Societas Rosicruciana in Anglia (S.R.I.A.). This is the first of three series of this journal. Contributions by K.R.H. Mackenzie (notably his visit to Eliphas Levi in 1861), Robert Wentworth Little, Dr. Woodman, William Carpenter, et al. Carpenter's contributions consist of a plea to take spiritualism and its phenomena seriously. Listed in F. Leigh Gardner, A Catalogue Raisonné of Works on the Occult Sciences, Vol. 1, Rosicrucian Books (London: Privately Printed, 1903).